Alta Citizen is home to outdoorsy and adventurous people who love living close to nature. The same goes for many who call Newport News, VA, home. Summer might be gone, but the lakes and rivers that surround your home are still great places to spend an afternoon and watch the sunset. 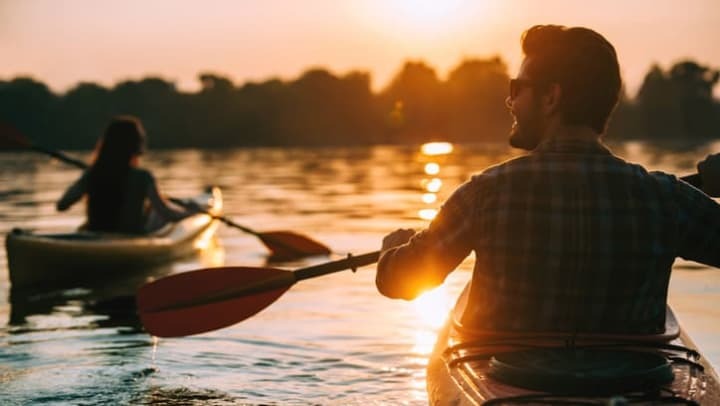 Whether you’re taking to the water solo or with friends, here are four canoeing and kayaking spots you’ll love this fall. Just a short drive from home on Denbigh Boulevard is a city-operated boat ramp and fishing pier on the shores of the Warwick River. Depending on how far you want to go, this trip can take a couple of hours or more. This fun and scenic float features views of Fort Eustis Army base and some beautiful homes that face the river. On your way from Newport News to Virginia Beach, you’ll find many beautiful places to enjoy some time in nature. One of our favorites is Stumpy Lake, right in between Virginia Beach and Chesapeake. According to the Virginia is for Lovers blog, you don’t even need your own kayak, canoe, or paddleboard. Once here, rent a ride from Wild River Outfitters. Stumpy Lake offers a great opportunity to float in a peaceful, motor-free lake while birdwatching and taking in the wooded views. And Stumpy Lake is a great place for first-time paddlers, no matter their age. Looking for a weekend-warrior type of trip? Pocahontas State Park might be your best option. There is so much to do in Virginia’s largest state park. Camp under a sky full of stars, explore the dozens of multi-use trails, and paddle in one of the three lakes, including the 225-acre Swift Creek Lake. Here, you can also rent your equipment and even take a guided canoe trip. When planning your trip to Pocahontas State Park, check the Virginia State Parks website to learn about trail status, events, and more. Virginia’s Eastern Shore has an amazing blog that every Virginian should follow. Here, they write about adventures, trips, and incredible places to visit, most of them very close to your home. Along Virginia’s Eastern Shore, you can lie on any of the many beaches, including Cape Charles, or enjoy a nice breakfast in Coach House Tavern. Explore the islands via boat tour, or take to the water with your kayak or canoe for a great time along the coastline. You can even do it all in the same day. When you choose to live in Alta Citizen in Newport News, you get the best of both worlds. Enjoy everything the city has to offer just moments from your home, and, whenever nature beckons, an array of beautiful places to explore are just a short drive away.